The philosophers played vital role in, spreading the ideas of Enlightenment. The philosophers can’t be regarded essentially as philosopher. The term has a wide connotation to include publishers, propagators, free lancers and journalists. They read the valuable works of eminent writers and scholars in various subjects and rewrote them in simplified form for the general reading public. Undoubtedly, philosophers had just claim to be called the ‘men of letters’. The great expansion of the reading public further facilitated the rise of Enlightenment. The educated middle class or the professional bourgeoisie was a more influential section of the European society, particularly of France and England. The commercial bourgeoisie also contained fairly good reading section, as did the gentry and even the nobility. Journals, magazines and newspaper increased in number and they were available in coffee-houses and restaurants too. A significant development in this regard was the great demand for dictionaries, encyclopaedias and surveys of all fields of knowledge. This reading public, particularly in France was highly violent, being possessed of sensibility and a sense of appreciation, not found in many civilized society of the present times. They read good books and also reflected upon them. From such a public, literature itself greatly benefited. There was mild censorship in France, though in England, censorship was removed after the GLORIOUS REVOLUTION of 1688. Legally forbidden to criticize the church or state, the philosophers made abstract criticism. Moreover, censored writings used to be more popular, and reached the people through illicit channels. Paris was the heart and soul of the Enlightenment. Respectable ladies in their salons and men of intellect exchanged views on many topics. It was a fashion in high society which carried with it prestige and intellectual excellence. The foremost among these writes was VOLTAIRE (1694-1778). He was perhaps the most honoured and well-known man in Europe in the middle of the 18th century. His thoughts and ideas so much influenced the 18th century, that impelled WILL DURANT, the eminent historian-philosopher to call the period as the ‘AGE OF VOLTAIRE’. The innumerable essays, letters, tragedies, comedies and books that he penned, established him as the most versatile and accomplished writer of his age. His sharp tongue, logical mind and sarcastic pen spelt constant danger to himself. On several occasions, he was went to prison and into exiles for his unsavoury remarks – though full of wit and humour. Voltaire was born in a bourgeoisie family and remained a bourgeoisie but has was not opposed to monarchy or aristocracy. After a struggling career as a writer, he was promoted as the official historian of Louis XV’s court, and earned friendship of such, celebrities as MUN DE POMPADOUR and FREDERICK THE GREAT, whom Voltaire admired as the ideal enlightened despots patron of arts and science and advocates of religious toleration. 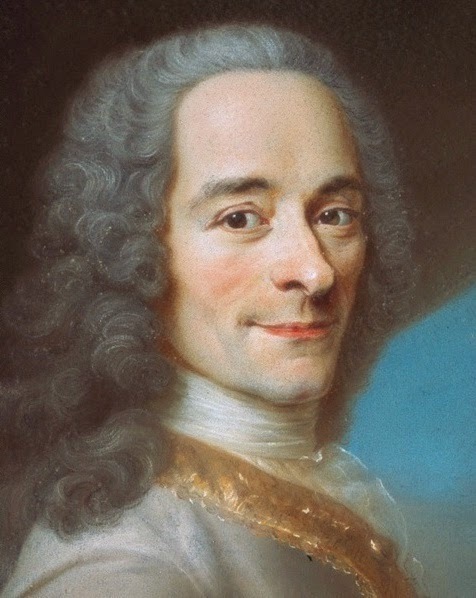 Voltaire advocated freedom of belief, thought and speech. His wide travels took him to England several times and he was like Montasquieu, great admirer of English parliamentary system, religious liberty and the freedom of expression. His two works PHILOSOPHICAL LETTERS ON THE ENGLISH (1733) and PHILOSOPHY OF NEWTON (1738) popularized in Europe Bacon’s inductive method, Newton’s laws of motion and Locke’s political ideas. He advocated religious toleration. The catholic church became the chief target of his attack for lacking toleration. In his work, EPIDUS, he vehemently attacked the church and priests. He commented, “of all sacerdotal empire, the most criminal is that of the priests of the Christian religion. He attacked not only the catholic church but the entire traditional Christian view of the world. He was gradually inclined towards ‘natural religion’ and ‘natural morality’, which led him to believe that faith in god and difference between good ad evil arose from reason itself. Moreover, he was first to present a purely secular approach to world history to replace conventional Christian framework. In his ESSAI SUR LES MOEURS (World History), he began with ancient China and surveyed the great civilization one by one. Being an advocate of enlightened despostism. Voltaire did not show any inclination towards liberalism or democracy. By enlightened despotim he meant one that fought against stupidity and devility, kept the clergy under subordination, promoted freedom of thought and encouraged the cause of national progress. 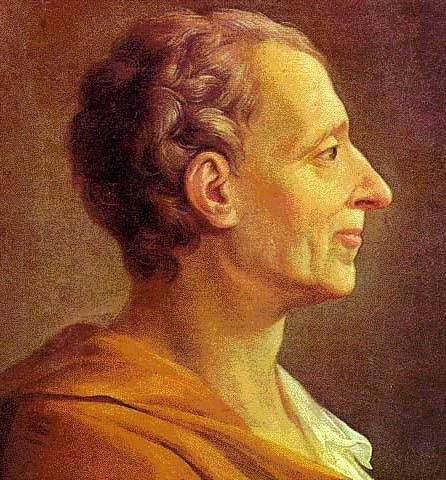 Another sparkling luminary of the 18th century French intellectual firmament was MONTESQUIEU (1689-1755). Unlike Voltaire, he was a landed aristocrat – as seigneur of monarial lord. But like Voltaire, he was also a great admirer of England, particularly the parliamentary system, which he keenly observed during his English tours. Though he was brought up in an atmosphere of noble resurgence that followed the death of Grand Monarch Louis XIV, and shared many of the ideas of aristocracy, he went beyond the self-centred class philosophy. He opposed monarchical absolutism. Through his magnum opus ESPIRIT DES LOIS (THE SPIRIT OF THE LAWS) published in 1748, he came to be regarded as one of the most brilliant political thinkers the world has known. In this work he presented two main ideas. The first one is that form of government varied according to climates and circumstances. He cites that despotism united only the large empires in hot climates and that democracy would work only in small city-states. His second contribution was the theory of SEPARATION and BALANCE OF POWERS, aimed against royal absolutism in France. He suggested that power should be divided between the king and the leading “intermediary bodies” like parliament, provincial estates, organized nobility, chartered towns and even the church. He felt that in England the separation and balance of powers was obtained by a nice mixture of monarchy, aristocracy and democracy (king, lords and commons) and by a separation of a function executive, legislative and judiciary. He was afraid that excessive centralization of powers in the hands of monarch would result in ruthless tyranny and destroy the liberty of the people. Though his ideas inspired a section of the revolutionaries and American freedom fighters, he was regarded as conservative by his contemporaries for his fascination for the feudal liberties of the early middle ages. 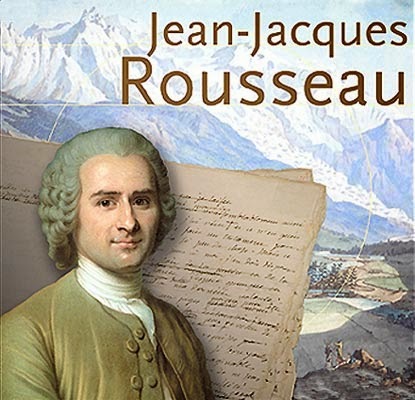 JEAN JACQUES ROUSSEAU (1712-78) was the most popular among the writers and philosophers. Born in Swiss Protestant lower class family, he never felt at home in the French society and experienced a childhood and youth full of hardships and strains. He did not attain any success as a writer till the age of forty. He lacked discipline and could never organize his family life or social relationship. He had no social status, no strength of character and no money and even after he became famous, he lived on the generosity of his friends. But though disorderly and disorganized, he was the most widely read and influential. Among his many works, the remarkable ones are ORIGIN OF INEQUALITY AMONG MEN (1753), THE SOCIAL CONTRACT (1762) and the novel EMILE (1762). He attacked religion, society and absolute monarchy. In the Social Contract, he states that “man is born free but everywhere he is in chains” – this kindled the spirit of “liberty, equality and fraternity” in the French revolutionaries. He also talked of the concept like the “State of Nature”, the “Noble Savage”, the “General Will” and the Sovereignty of the People”. Like Hobbes, he found the state of nature without law or morality. Man became bad, due to evils of society and as an Enlightenment thinker, he believed that only an improved society can produce good men. The social contract, he viewed was not only political but also social in character. Whereas Locke believed that the contract was an agreement between the ruler and the people, Rousseau noted that it was an agreement among the people themselves. EMMANUEL KANT (1724-1804) was another highly esteemed name among the Enlightenment Scholars. But, though influenced by the powerful wave of the Enlightenment, he carried trends which virtually meant a protest against the Enlightenment. The interesting point is that he was not a French but a German philosopher. Not only that he has been regarded as one of the greatest figures in the history of philosophy. He lived a peaceful life at the German city of KOENIGSBERG. He was educated at the University of Koenigsberg in Prussia and later became a Professor of LOGIC at METAPHYSICS at the University. He was thoroughly involved in teaching and study and was involved in evolving a system of though that influenced all succeeding philosophers in one way or the other. He wrote many books and the famous ones among them are CRITIC OF PURE REASON (1781),FOUNDATIONS OF THE METAPHYSICS OF ETHICS (1785), CRITIC OF PRACTICAL REASON (1788), AND RELIGION WITHIN BOUNDARIES OF PURE REASON (1794). From the titles of the works it is clear that he became annoyed with too much emphasis on reason by the enlightenment scholars. He tried to raise Rousseau’s argument to the level of Metaphysics. In that way he was a thinker who was born out of Philosophus school but raised a not of protest against it. He viewed that merely reason cannot solve all the problems of human life. Religion, morality and ethics too have a place in man’s life and thought. Kant’s thinking came as a pleasant shower to numerous fed up with the parched land of reason. Kant believed in a higher reality reaching ultimately to God. He called the internal values of the higher world as NOUMENA which was very much in contrast to the PHENOMENA of the material world. However, Kant also believed that the knowledge of Noumenal world reached men though reason. But this reason cannot be termed as ‘common sense’ as the enlightenment scholars interpret it. Rather, as Kant believes reason should mean ‘intuition’. The highest expression of the Kantian reason was the ‘categorical imperative’. By this he means the moral law within the conscience implanted in man god. By this Kant feels that an individual when confronted with a choice between good & evil, he must choose the good. Pure reason many not always support the good. Kant’s redefinition of reason and his attempt at restoring conscience and morality marked a high point in the philosophical reaction against the dominant rationalism of the Enlightenment. 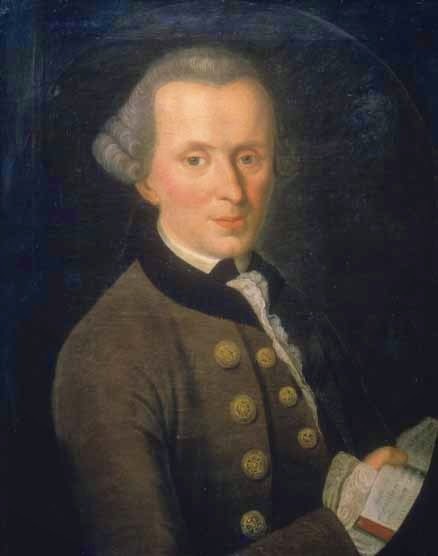 The interesting point is that Kant’s viewpoint reflected itself equally well at the popular level with the advent of Evangelical movements in Germany, France and England in the 18th and 19th Centuries. All these movements put emphasis upon charity, good life, pure thought and service to humanity. Another well known group of scholars was that of the PHYSIOCRATS. This can be regarded as the first group of economists in history. They together formed the school of economic thinking known in history for propagating the theory of LAISSEZ-FAIRE. The leader of the school was DE QUESNAY. These economists also championed the cause of individual freedom – especially in the economic sphere. They anticipated the gradual decline of the state monopoly and mercantilism, and the advent of free trade or industrial capitalism. In that sense, they greatly influenced ADAM SMITH whose classic work WEALTH OF NATIONS (1776) clearly acknowledged it, and other classical economists of England, in the late 18th and early 19th centuries. The Physiocrats believed in free enterprise, free trade and free exchange. They also advocated individual right to property and possessed abiding faith in the natural law. They felt that the individual is a natural product guided by natural law; he has an inherent tendency, for self-development and so he should be given absolute freedom of economic pursuit to his liking. The state interference, according to them, would put an artificial constraint upon his activities and thus would crush his talents. So, they emphasized maximum individual liberty and minimum state interference. The groups of intellectuals greatly enhanced the glory of the Enlightenment, and contributed to the growth of knowledge and wisdom. The most distinguished among these groups was that of the ENCYCLOPAEDISTS – so called because this group was patronized through a journal of exceptionally high standard named THE ENCYCLOPAEDIA. It’s editor was the illustrious personality of the contemporary French intellectual circle, DIDEROT. It contained articles and essays on literature, philosophy, religion, history, art, science and technology. The contributors included such great names as ADDE SIEYES, MIRABEAU, COLBERT, MUN DE STAEL and many others. The essay were read and discussed by the educated section of the French society. They used to set standards in French intellectualism. They not only informed and educated, but also enlightened. As for a young writer, it was considered as immensely prestigious to get on article published in an issue of Encyclopaedia. The writer’s in general attached great importance to freedom of thought and speech, religious toleration and forward-looking attitude. It is indeed true that the Encyclopaedists championed the cause of freedom and progress, and considerably influenced the thinking of the leading figures of the FRENCH REVOLUTION of 1789.